Home Informations Guides and Advices for Chihuahua Bringing your Chihuahua on the Beach, Guide and Advices. Practical tips to bring your dog to the beach. Put on your flip-flops, the sunglasses of the latest fashion, take the umbrella on the shoulder and let’s go to the beach! Of course, an afternoon with friends at sea is less fun knowing that we left our hairy friend bored alone at home ; so why do not bring him too? With some adjustments, you can, in fact, live together unforgettable summers! First of all, it is necessary to check out the beaches in which the dogs are welcome; in this regard, the web is now full of information sites that show all the most famous shores in which even our Chihuahua will be able to take advantage of the wet. Once you have chosen your destination, you will need to have everything you need for us and for our little friend. We suggest: two towels (one to allow him to relax and one to dry it after a bath), the muzzle (which may be required by beach regulation but NOT REQUIRED TO BE ON. But only to be handy, and to get put on in the exceptional case where it is essentially needed), light food and water if you want to keep it for the whole day on the beach. Remember to bring the dog toilet bags to pick up any needs, it would be better also to bring your hairdo to your needs before arriving on the beach. Prepare the bags … we are leaving! 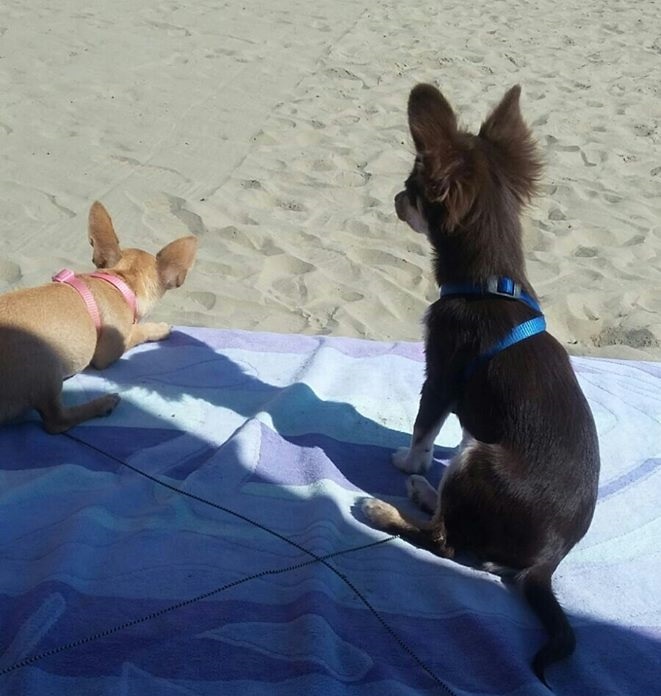 Once at the beach is very important to find a place, to place the towel, where there is at least a small area of shade where our Chihuahua can take shelter during the hottest hours of the day, thus avoiding a possible heat stroke. In fact, it is highly advisable not to keep the dog under the sun for a long time during the day. In addition, to overcome this problem, you can use the technique of bathing its head with water, to keep your body temperature low. In any case, this method cannot be replaced by a shelter that is, however, essential! Even during boat or raft trips, do not be fooled by the refreshing wind that invites you by picking up speed, as the sun continues to carry out its action and it could surprise our friend with a heat stroke. Make sure throughout the day that the dog has a bowl of fresh water to drink. The good education standards should be maintained, of course, like in any public setting, this one applies even on the beach. Avoid annoying the neighbor’s umbrella, keep the dog on the leash if there is a chance that this will attack other subjects, pick up stools, and so on. Tips for the first bath of a Chihuahua on the sea. Once you get to the beach you have to be careful, too, at the first approach with the sea, the lake or the river. If the Chihuahua never had a bath in its life, it would be good to approach calmly with what can become a great obstacle for him – water. In fact, there are dogs that, of course, are naturally predisposed to swimming while others may hate it without even having tried to touch the water with a buzz. Obviously on this, however, we can partly influence it by helping them with the first approach. The best technique to use is definitely that of patience. We have to wait for the Chihuahua to approach the shore with its time, without forcing it to get into the water right now and maybe inviting it by entering us first and demonstrating that there is nothing to fear. If the dog does not want to enter, do not force it, maybe it will be better next time, but it is strongly advised not to throw it in water, which could only traumatize it and greatly will increase the time of being accustomed with the sea. It is also good to remember that a Chihuahua does not have our own physical presence and that it could quickly get tired by swimming, so you do not have to take it to swim right away. We always stand by him, without losing sight, keeping an eye on his state of fatigue, and if even help him get back to the shore. 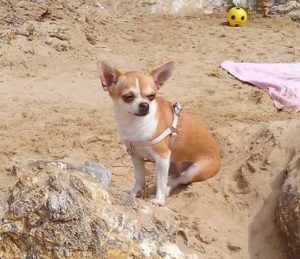 If our Chihuahua agrees to swim with us, after the bath or return home after a day of the sea, it is good practice to rinse it with fresh water to remove salt residues and sand or dirt from hair and skin. Just a rinse, since if you bring your dog to the sea for more than a few consecutive days or in a short time, wash it every day with shampoos, could ruin the hair. Next articleChihuahua dental care, Guide and Advices.